The U.S. Treasury Department and the Internal Revenue Service (IRS) today announced that they will formally adopt modernized regulations regarding the withholding and reporting of pari-mutuel proceeds. 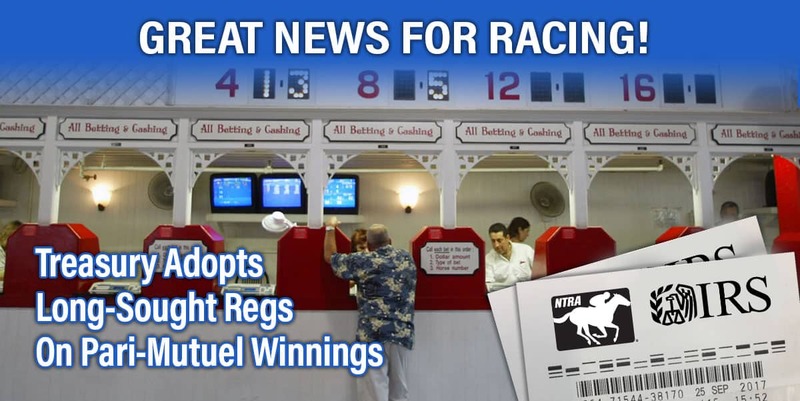 The National Thoroughbred Racing Association (NTRA) has long pressed for these updated regulations that will allow horseplayers to keep more of their winnings, thereby increasing the amount wagered on U.S. pari-mutuel racing by as much as 10 percent annually, or upwards of $1 billion, according to independent estimates. The new rules were posted late Monday afternoon as a Public Inspection Document. They are scheduled to be officially published in Wednesday’s edition of the Federal Register and will go into full effect by no later than Nov. 14, giving racing associations, totalisator companies, and advance deposit wagering (ADW) operators up to 45 days to implement these important changes; however, some may elect to start as soon as Thursday. Under the new regulations, the IRS will consider the inclusion of a bettor’s entire investment in a single pari-mutuel pool when determining the amount reported or withheld for tax purposes, as opposed to only the amount wagered on the correct result. For example, the amount wagered by a Pick Six player who hits with one of 140 combinations on a $1-minimum wager now will be $140, which is the total amount bet into the Pick Six pool. This more accurate calculation will remove the significant reporting and withholding obligations on horseplayers and the unnecessary paperwork for the IRS that was a result of the prior rule that used only the $1 bet on the single winning combination as the amount wagered. The amended regulations, advocated by the NTRA and its legislative team, define the “amount of the wager” to include the entire amount wagered into a specific pari-mutuel pool by an individual – not just the winning base unit as is the case today – so long as all wagers made into a specific pool by an individual are made on a single totalisator ticket if the wager is placed onsite. The modernized regulations will have the same positive results for ADW customers and will not impact how those wagers are currently made. View the full text of the new rule under section 3402(q) of the Internal Revenue Code here: https://s3.amazonaws.com/public-inspection.federalregister.gov/2017-20720.pdf. The NTRA has pushed for the modernization of pari-mutuel withholding and reporting rules for several years. As more and more pari-mutuel wagering was directed toward exotic wagering pools it become clear that the tax rules were becoming an increasing and unfair burden on horseplayers as those outdated rules significantly increased the incidence of winning tickets subject to withholding and reporting. These new rules are the product of all the work the NTRA, and other industry stakeholders, undertook with Congressional representatives and Treasury and IRS officials. Waldrop noted that the NTRA has been working behind the scenes since January with industry groups – including totalisator companies, ADWs, and racing organizations – to ensure a smooth implementation for customers.